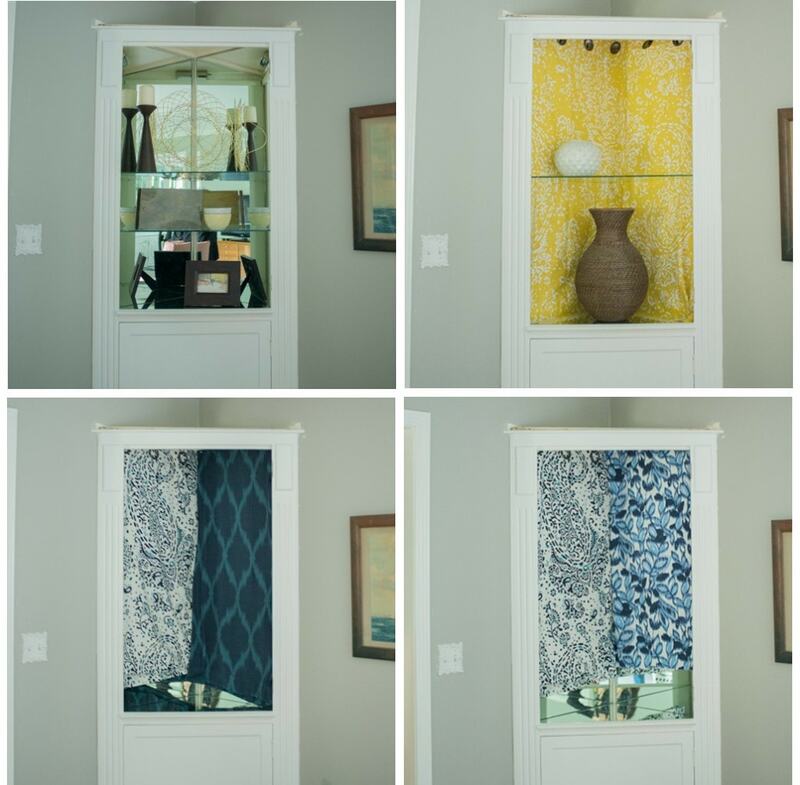 If you’ve been following along on my living room, then you know that I had a dated corner cabinet that I wanted to take out and try to modernize. Well, after taking off the top part of the cabinet, we were left with holes in our drywall. Some were actual holes, other issues included torn drywall paper, and rough spots with the drywall. So, today we’ve put together a video tutorial for drywall repair showing you how to repair drywall in general, repair drywall using a patch, repair drywall using tape and just tips and tricks for finishing off the job so that it looks great! 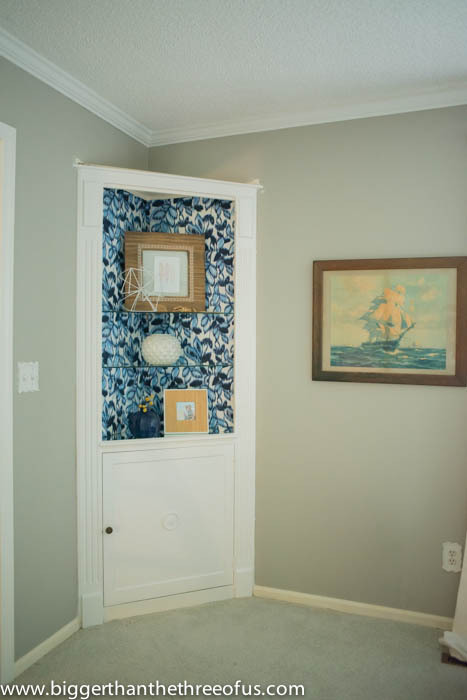 I’m still not convinced that I can modernize the corner built-in even after repairing the drywall, so make sure to chime in on that part in the comments section! 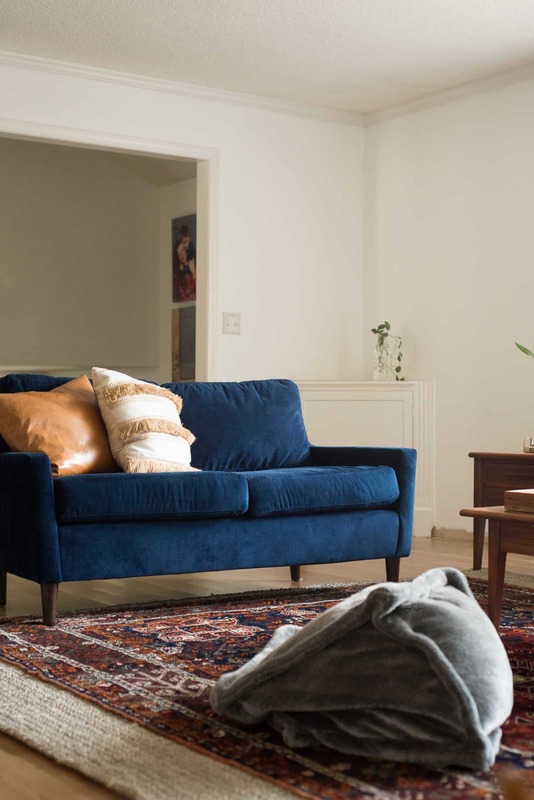 I’d love to hear your thoughts on the space in general… it’s totally throwing me for a loop! The corner cabinet in our living room has been something that has bugged me for years. Years and years ago, ok, like maybe three years ago, I worked on updating it with fabric. Those are a bit embarrassing. Ha! I’ve been blogging a long time guys. As you can see from the flooring, this was before we had our hardwood installed. As you can probably tell from that picture, now my style doesn’t mesh at all with what I had before. So, about a year and a half ago, I took down the fabric and the shelves and the cabinet sat empty. 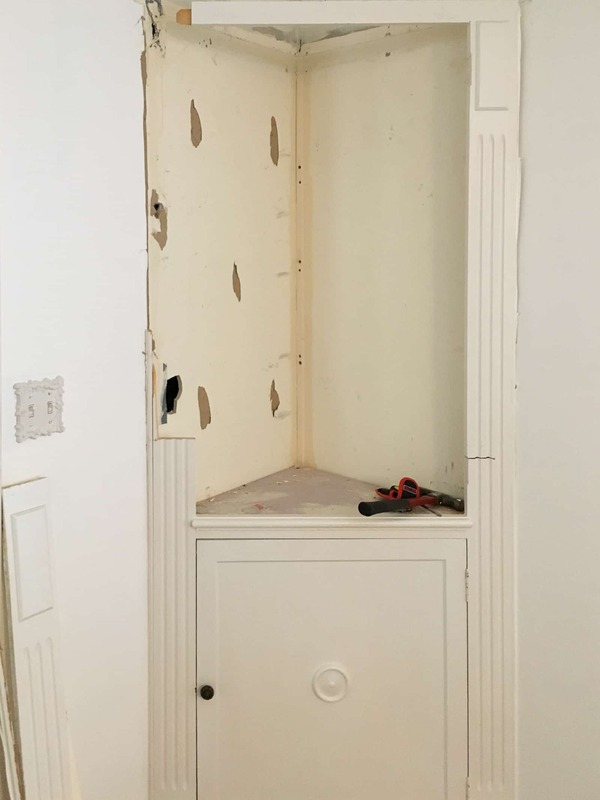 Then, I decided that I was either going to modernize the cabinet and keep it or figure out how to install flooring to match underneath the cabinet when I ripped it out. Modernizing the cabinet seemed to be the easiest thing to do so that’s what I wanted to try first. After I took the top part of the cabinet off and the glass panels, I was left with large issues in the drywall. Patching and mudding drywall isn’t a hard job but it is one that you have to do in steps. We’ve done a few drywall projects before: how to hang drywall and how to mud new drywall but we’ve never talked about the best ways to fix holes in the drywall. 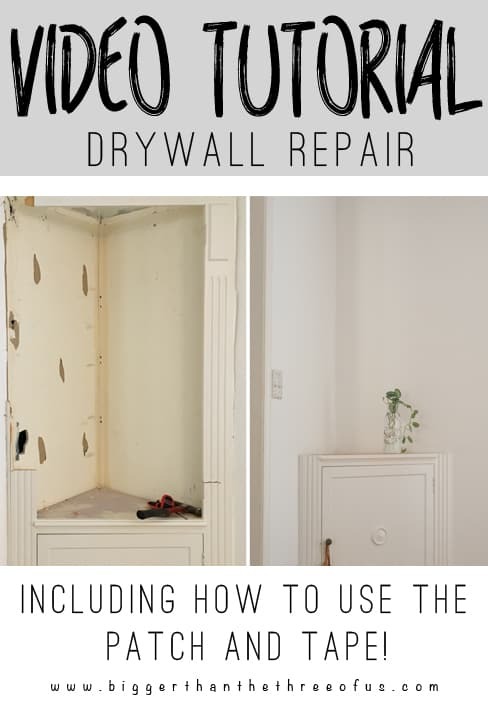 Today’s tutorial will walk you through the ways you can fix all sorts of drywall issues including holes in the drywall and tears in the drywall. Before you are actually finished with your wall, you have to paint. We did that and it looks so much better! The discoloration close to the seam of the wall is a shadow that I just couldn’t get to photograph better. So, now that I have my corner fixed and have been looking at my built-in… I still don’t like it. 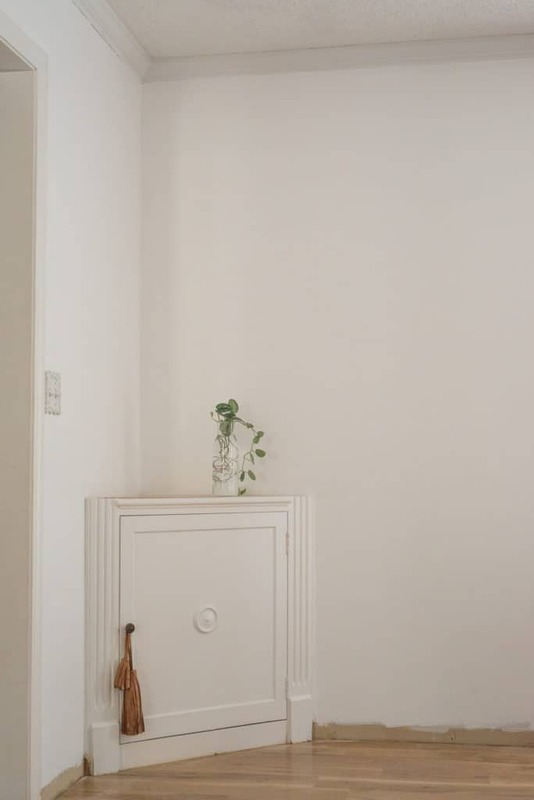 I wanted to have a seamless look with a built-in top but I can’t find a way to get the look when the cabinet is in the corner. I see lots of things that I like with a straight cabinet but the way to get the seamless look just isn’t possible on a corner cabinet. The other option would be to put in corner floating shelves, but again, I think the corner part of it makes floating shelves look weird. 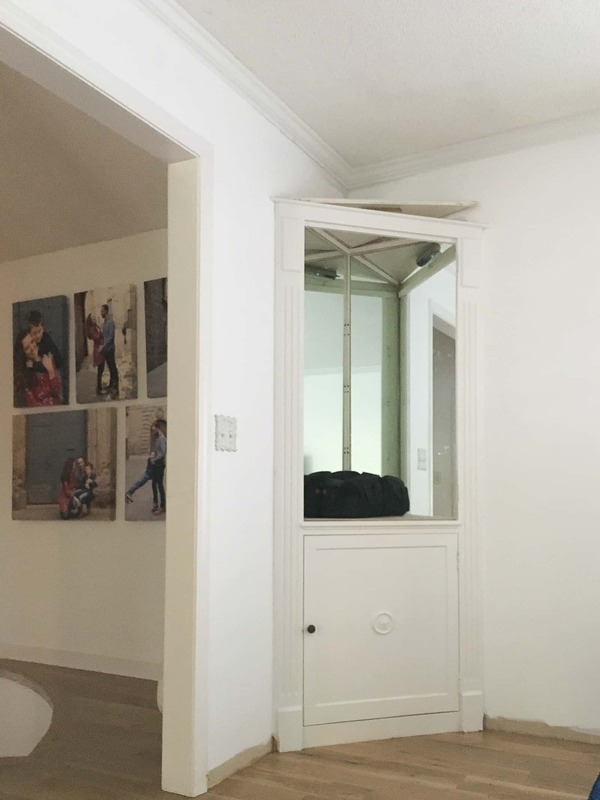 So, if you were me… would you rip the cabinet out completely and have a hardwood installer come back out to reinstall hardwood in that corner? They would have to sand and stain and finish it on site because that’s the type of hardwood we got. Sounds annoying, right?